Most companies acknowledge that contingent labor is a vital component in achieving their business goals. That’s why it is so important to understand the trends – ones that enable you to prepare proactively – instead of scrambling before it's too late. What if we showed you what's going to happen, how it will affect you and what to do about it? In other words, what if we showed you how to win the war for talent? Much is changing in the world of sourcing and contingent workforce management, and you need to prepare so you aren't left behind. The way organizations engage with talent will continue to shift. Technology will continue to impact procurement. To remain effective, the procurement function will need to evolve. Contingent Workforce Management 3.0 – How Does Your Organization Stack Up? Before we talk about the future, let's take a quick look at where we've been. In the mid-1960s, materials management was the focal point. Procurement was largely about getting the right materials to the right place at the right time. As such, procurement took on a managerial role. During the challenging economic environment of the 1970s, commodity price volatility and inflation caused purchasing professionals to emphasize commodity buying. Trading and negotiating skills were valuable. By the 1980s, there was a significant increase in supplier competition. This allowed organizations to focus on supplier quality and dependability. Purchasing shifted toward procurement or supply management and began to work internally as well as externally. This was also the beginning of a new concept called the supply chain. 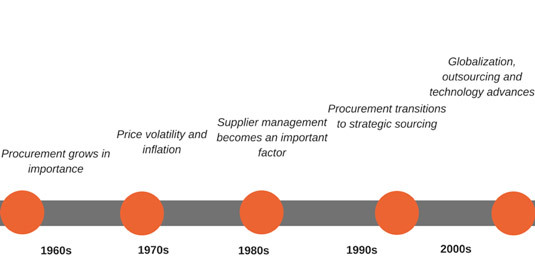 In the 1990s, procurement's role began to transition into strategic sourcing. Long-term contracts became more important and procurement officials began to look at suppliers as partners. Technology advances, outsourcing and globalization all contributed to the growth of tools like category management. Most recently, in the 2000s, several factors converged to prompt another shift in purchasing. Partially due to the Internet and easier access to data, strategic sourcing, partnership working and corporate social responsibility became more important. Procurement teams began to collaborate with colleagues and suppliers. They also began to think beyond cost and about how to add value to the overall enterprise. Not to mention the proliferation of outsourcing and global sourcing requires much greater levels of service contracting management. What's the key to preparing for the changes ahead and improving performance and risk management? You must anticipate the changes and adjust accordingly. As you know, procurement is changing, so here are 4 ways you can get ready. Increase spend visibility. Spend visibility is an essential component to any procurement change. That is because to manage supply more effectively, you have to manage spend. Spend is what you pay and supply is what you get, and to manage spend, you have to see it. Share the knowledge. Making everyone better at procurement will be the single most transformative objective that procurement can achieve. It will have a direct impact on your organization's bottom line. When you build a “procurement mentality” in your staff, you can increase compliance, reduce risk and realize more cost savings. Be prepared to use technology. The pace of technology development is not going to slow down. If anything, it will increase. Procurement professionals need to know how to use technology to manage supply chains and get business results. Get strategic. Procurement needs to move away from the dominant focus on unit cost reduction that still prevails in many organizations, to playing a wider and more fundamental role in the organization. What do you think? How are you preparing for the changes ahead? Let's keep talking. Join us on Twitter to chat about how you're adapting your contingent workforce management strategy.